As orchards age, yields decline for a number of reasons and eventually the decision is made to remove the orchard. The age at which an orchard is pulled is a unique decision for each block, depending on yield, price, demand, and resources. There are a number of recommended steps in removing an orchard, especially when preparing to replant that orchard into walnuts again. Getting a walnut orchard off to a good start is essential considering the investment cost required to develop a new orchard. If you are removing an existing walnut orchard that will be replanted, it’s a good idea to plan for an 18 to 24 month transition between orchard removal and planting new trees. Trying to rush the operation creates several opportunities for a less satisfactory outcome. When replanting a walnut orchard, first figure out what carry-over problems you’ll need to deal with from the last orchard. Use this information to figure out whether to fumigate and with what product, what to plant during the fallow period and what rootstock to select for your future orchard. 1. Assess potential carry-over problems before harvest. There are a few problems that may carry over from an old walnut orchard to a new one planted on the same ground if preventative or corrective steps are not taken: the walnut replant problem, nematodes and crown gall. The walnut replant problem, sometimes called the rejection component, is not linked to any one pathogen. There are a variety of biota that build up in the soil, feeding on the roots of mature walnut trees. These populations will hinder the growth of young walnut trees when they are replanted into the same soil. Killing the roots of the old orchard and rotating in a non-walnut crop for a year is effective at addressing this problem. 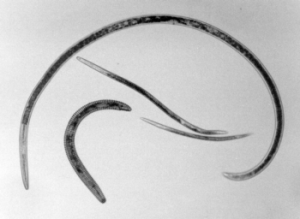 The root-lesion nematode of concern in California is Pratylenchus vulnus. 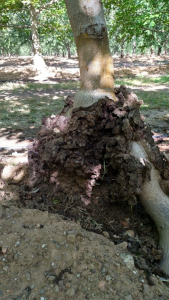 English walnut, seedling Paradox hybrid, and black walnut rootstock are all highly susceptible, with each root tip capable of supporting thousands of nematodes per gram of root. Any previous tree crop planting is likely to have hosted P. vulnus. Retired UCCE Nematode Specialist Mike McHenry estimated 85% of walnut orchards have nematode levels that are too high to replant without taking some measures to address them. To sample for nematodes, take a number of soil core samples down to 36 inches across the orchard. See the UC IPM Guidelines for more sampling details and other nematode management information, or speak with the lab to which you’ll be sending your samples. The four primary types of nematode: ring nematode (short, fat c-shaped), root lesion nematode (longer and skinny), root knot nematode (shortest), and dagger nematode (longest). Photo: UC Kearney Agricultural Research and Extension Center. Crown gall, caused by the bacterium Agrobacterium tumefaciens, can be a serious problem in some old orchards. Inoculum built up in the soil can infect through wounds or natural openings (e.g. where lateral roots develop). Once A. tumefaciens is introduced into a field site it has the ability to survive for at least 2 years in the orchard soil and at least 1.5 years in non-irrigated fallow soil, and still induce crown gall formation. Research found chloropicrin and 1,3-dichloropropene together in Telone® C-35 dramatically reduced A. tumefaciens populations in soil, but not in buried gall tissue. When applied alone, 1,3-dichloropropene (Telone® II) was not effective at controlling A. tumefaciens. In sites with a history of high crown gall incidence, fumigation with Telone® C-35 followed by chloropicrin combined with extensive gall removal from the soil should be considered. At planting time, here are more tips for preventing crown gall. Walnut with extensive crown gall. Photo: D. Lightle. 2. Kill the roots of the old orchard. In decades past, methyl bromide fumigation could be relied upon to kill old roots and any nematodes in them, along with other pests and diseases in the soil. Fumigants that are currently available can address nematodes and some pathogens in the soil, but they are not good at killing old roots or anything living in them or feeding on them (i.e. nematodes, walnut replant problem biota). To accomplish this, an herbicide is necessary. During the month of October (some leaves should still be on the tree, but you can wait until after harvest), cut trees a few feet above the ground and within 5 minutes paint the stump with straight undiluted Garlon3A or a 1: 3 mixture of Garlon3A and MorAct or equivalent surfactant. Leave painted stumps in place for at least 60 days. This time is necessary to allow herbicide to fully circulate and kill as many roots as possible. For more on this approach, see UCCE Nematologist Emeritus, Dr. Michael McKenry’s “Guidelines for Replanting Walnuts”. 3. Wait a full growing season before replanting walnuts. If fumigation is deemed necessary, based on nematode and/or crown gall pressure, a fallow period is critical to dry down the soil to 12% moisture, the level necessary for optimal fumigant efficacy. Fumigants move through air, not water. Soil aggregates with films of liquid can act as a secret hideout for the nematode you’ve paid so much money to try to kill. For most of the finer textured soils in the Sacramento Valley, a spring-summer crop of Sudan grass or safflower may be needed to pull out deep soil moisture. These crops also have the benefit of decreasing nematode populations. Ripping and reworking the soil in the summer can also dry down the soil, but is not always sufficient. An approach which has been applied in strawberries and is currently being tried in almonds is Anaerobic Soil Disinfestation or ASD. This alternative to fumigation is generally done in the sunny summer months after an orchard is removed. The soil surface is covered in plastic and soil microbes are encouraged to deplete the oxygen enough to create a toxic environment for undesirable microbes. The approach has not yet been tested in walnuts, but may show promise in the future. Research is ongoing. Anaerobic soil disinfestation (ASD) in strawberries. Photo: UC Cooperative Extension, Santa Cruz County. Prepare soil for the new orchard planting as much as possible before fumigation. This will allow for more even delivery of soil fumigants, and minimize disturbing the soil you’ve spent good money to sanitize and reintroducing undesirable biota from below the fumigated soil zone. 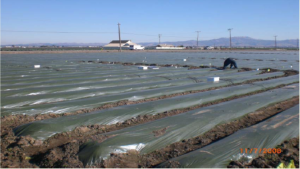 Successful fumigation requires soil that is warm (above 55°F at one foot depth) and dry (ideally 12% moisture). For this reason, fumigation is generally done between August and November. The choice of fumigant will depend on the assessment of carry-over problems from the previous orchard. Telone II (1,3 dichloropropene) is a nematacide. It has been shown to be very effective at killing nematodes. It is not, however, effective alone at controlling crown gall. Work done on Prunus Replant Disease would indicate Telone II alone would also not be effective against the walnut replant problem. Chloropicrin and 1,3-dichloropropene together in Telone® C-35 will target nematodes and A. tumefaciens. 5. Replant on an appropriate rootstock. Table 1. Preferred rootstocks for problem situations. Based on data from ongoing UC and USDA-ARS trials. The disease resistance indicated is only a comparison between the three clonal Paradox rootstocks and is not necessarily the level of disease resistance when compared to seedling black or seedling Paradox. *In field trials with grafted trees, the vigor of the rootstock isn’t necessarily reflected in teh vigor of the scion, e.g. sometimes grafted trees on RX1 and Vlach are more vigorous than on VX211. **Level of resistance depends on Phytophthora species. Pulling and replanting a walnut orchard presents many challenges and resources. Identifying problems ahead of time and developing a plan of orchard removal, field treatment, potential fumigation and the appropriate rootstock will help ensure a healthy, robust orchard.